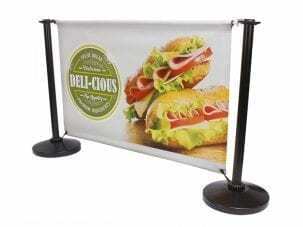 We manufacture custom replacement Cafe Banners for your existing Cafe Barriers system. Replace your old tired banners with fresh new ones to attract more customers to your business. 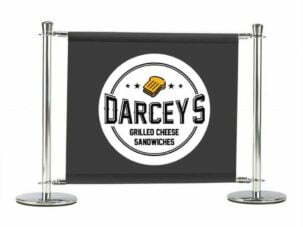 Made to fit any system, we offer a choice of PVC, Mesh, Fabric and Canvas Cafe Banners to suit your budget and requirements. We can print any design in glorious full colour to match your branding and create that wow-factor. 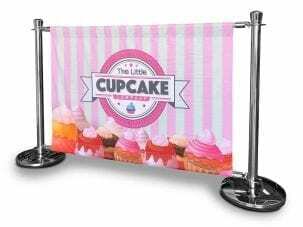 We manufacture and print replacement cafe banners for any Cafe Barriers system, to any size or specification – at trade prices. Stock materials include PVC Banner, PVC Mesh, Fabric and Heavy Duty Canvas. Choose your preferred material and simply enter your banner dimensions for an instant trade price. Don’t forget to select your finishing specifications – either sleeve pockets top and bottom, or sleeve top and eyelets bottom corners. We can print logos, text and photographs onto your new Cafe Banners. If you are ordering several banners, feel free to supply different artwork for each banner at no extra cost. We use a 500gsm Premium tear-proof PVC Banner for single sided prints (white reverse), or a 650gsm Blockout PVC for double-sided prints. 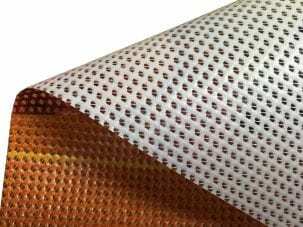 Our 330gsm PVC Mesh is finished with heavy duty hems to withstand outdoor conditions. The fine mesh allows wind to pass through. 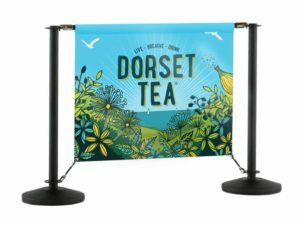 Our range of full colour printed fabrics are chosen specifically for Cafe Banner use and are suitable indoors and outdoors. The vast majority of cafe banners will have a sleeve pocket sewn in at the top, and either a sewn pocket at the bottom (if your system has a bottom rail) or bottom corner eyelets. You should measure your existing Cafe Banners before ordering replacements.